Once a year, generally on the last Thursday of January, the Astronauts Memorial Foundation welcomes the public to join assembled astronauts, family members and space program workers to remember the U.S. astronauts who lost their lives while serving on active duty. On Thursday, Jan. 25, 2018 those lost were remembered and their sacrifice honored. Held on the grounds of the Kennedy Space Center Visitor Complex, NASA Day of Remembrance ceremony included an indoor component led by Thad Altman, President and CEO of the Astronauts Memorial Foundation, as well as an outdoor wreath laying at the Space Mirror Memorial. Following the Presentation of Colors by the Patrick Air Force Base Honor Guard and the playing of the U.S. National Anthem by Pri Thakrar and Josh Johnson, two engineers from Kennedy Space Center, retired NASA astronaut Eileen Collins shared some opening remarks and invited a number of esteemed guests to be recognized. 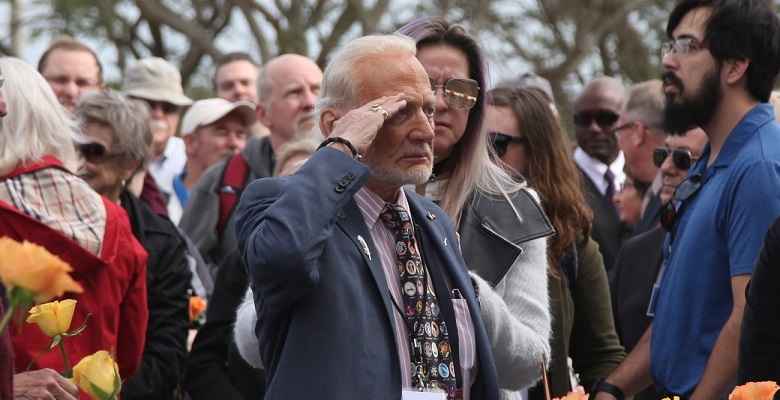 In addition to such highly-recognizable attendees as Dr. Buzz Aldrin of Apollo 11 fame, Thursday’s ceremony also included a number of family members of those lost, including Karen Stevenson, daughter of Charles A. Bassett, II, Sally Kneuven, daughter of Elliot M See, Jr., Beth Williams, widow of Clifton C. Williams, Brent Adams, son of Michael J. Adams and Tal Ramon, son of Ilan Ramon – the first Israeli astronaut and lost crew member of STS-107 (Ramon flew on Space Shuttle Columbia which was lost 15 years ago this February). Tal Ramon, an accomplished musician who flew to the Space Coast from his home in Israel for Thursday’s ceremony, performed two touching songs, one on either side of his spoken memories, reflecting on the connection he was able to make with his lost father upon returning home following Columbia’s break up and finding his father’s piano sitting before him, silenced. Under a light layer of clouds and with a cool breeze blowing, the ceremony proceeded outside for the laying of the wreath and the personal presentation of flowers along the receiving fence in front of the Space Mirror. As the formal ceremony concluded, touching conversations followed – family members sought out and thanked NASA program workers who had been a part of their loved one’s lives, while community members reflected with each other about what the sacrifice of those brave men and women meant and continues to mean to them.